Monday's WSJ carried an interview with Jim Owens, who is the CEO of Caterpillar. Besides giving a great overview of the company's business operations and prospects, what surprised us most was what was not said. The interview opens with the writer of the article heaping praise on Mr. Owens, and saying how since he came in three years ago, revenues have doubled in size. When asked however, how it was that the company was able to accomplish such a feat, rather than say something like, "When I came in here I refocused our operations and motivated our sales force to increase share. ", he simply gave credit where credit was due. His answer was, "We've done it on the strength of the global economy." How Are Yesterday's Declines Doing Today? 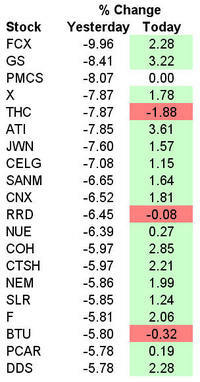 Below are the 20 worst performing stocks in the S&P 500 yesterday and how they are currently performing today. Today's S&P 500 A/D line is +159, but 16 out of 20 of yesterday's biggest decliners are currently up. Goldman Sachs (GS) and Allegheny Tech (ATI) are having the best recoveries, up 3.22% and 3.61% respectively. We all know by now that the sudden 200 point drop in the Dow yesterday was due to a calculation delay caused by information overload by Dow Jones' data systems. Below we calculate how the intraday price chart should have looked based on the actual price changes of the Dow's 30 components. 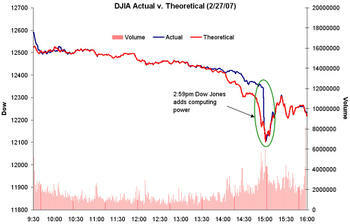 As the chart shows, the calculations began to go awry a little after 1:30 pm and continued until the computers finally caught up at 3:00 pm. Just like one blowup can damage years worth of work to build up positive reputation (JBLU), one big decline can damage months worth of market gains. After days like yesterday, it is good to review the trading ranges of various stocks, sectors and indices to see where they currently stand. Below we provide overbought/oversold charts of US sectors and indices. 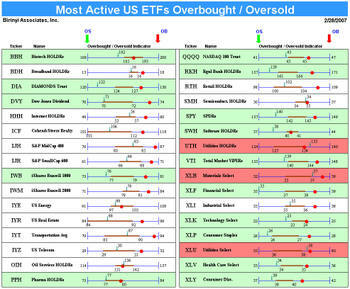 As shown, many areas that were overbought just two days ago are now oversold. Utilities, materials, and fixed income are the only areas that are currently overbought. 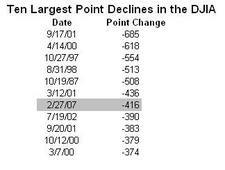 Today's 416 point decline in the DJIA represents the seventh largest point decline in its history. It also ends a streak of 1098 trading days without top ten point gain or loss, which is the fourth longest stretch since 1920. In other words, since October 2002, there has not been a one day point change in the Dow that qualified as one of the ten largest up days or ten largest down days. While we realize that it is certainly more practical to compare percent changes over point changes, it is still interesting to note that since the early days of the bull market in 2002, today was the first up or down "big day". 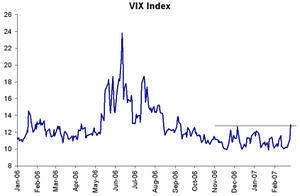 Today was by far the largest increase (64.22%) in the VIX since 1990, the furthest Bloomberg lets us download prices. Earlier in the day we noted the breakout of the 10 to 12.5 range. 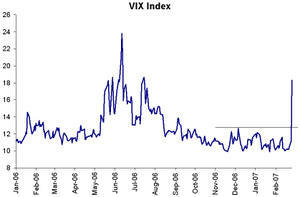 See the chart below for where the volatility index closed (18.31). As a follow up to our prior post, the S&P 500 A/D line got much worse, along with the performance of the index itself. For the day, just two stocks in the index closed up -- RSH and STR, leaving the A/D line at -496. This is the third worst reading in the past ten years. 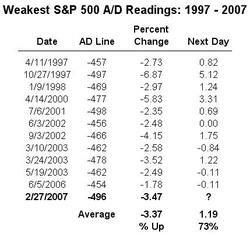 Below, we list the weakest S&P 500 A/D readings since 1997 and show the next day performance of the index as well. As shown, the index has gone up 73% of the time the next day for an average gain of 1.19%. This post was originally published on Tuesday morning, and as we know now things did get worse. 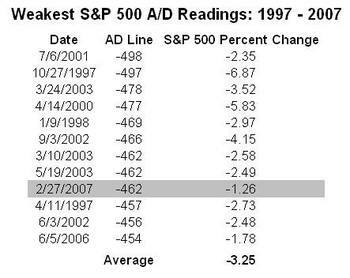 With the S&P A/D line showing up at minus 462 today, this is the ninth worst reading in the last ten years. Looking at all days where the S&P daily A/D reading was minus 450 or more, we found that the average decline on the day was over 3%, which makes today's 1.3% decline (as of 11:30) seem paltry. While the S&P 500 and the rest of the US markets are close to where they opened this morning, some stocks that gapped down have recovered nicely. 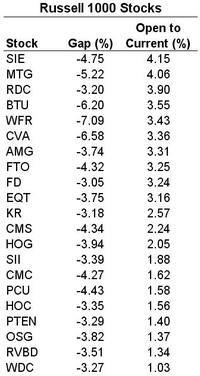 Below is a list of Russell 1000 stocks that gapped down more than 3% and have since recovered at least 1% from the open. With today's market declines, the VIX has popped above its 6-month range between the 10 and 12.5 level and currently stands at 12.90. Investors who have become complacent might not have been ready for the action today, but I'm sure it's welcomed by a few.